A unique Indian chutney recipe made with chickpea flour and yogurt. Pairs best with puri/roti/bread/dosa/idli. 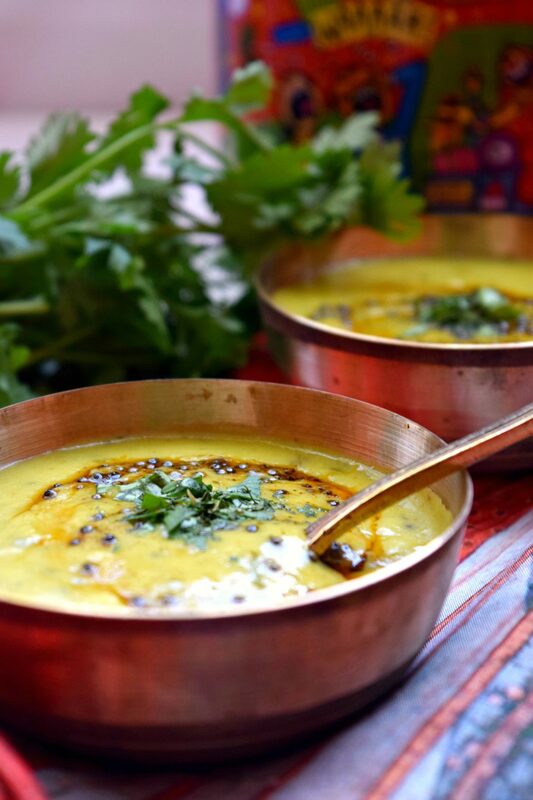 A simple yet delicious recipe from Bombay! What a gorgeous looking chutney this is! My MIL mentioned to me about this chutney. She said that its famously known as the Bombay Chutney and I was bewildered. I had never even heard of it, forget tasting it while I was in Bombay all my life. So it did come as a surprise to me and I quickly researched on it while still talking to her. Internet pulled out a couple of recipes with this name and I was hooked. Being the inquisitive type, I asked my MIL to tell me more about this dish and also share her recipe. I believe in trusting her recipe more than the internet as it’s more first hand with handy tips. She was more than glad to help. In fact my in-laws keep hunting for lost and forgotten recipes to share with me for my blog. Cute right?! The need to make a side dish was raised because I was asking her for some ideas to cook sweet potatoes. While we were brainstorming together over the phone, we came up with the idea to make Sweet Potato Masala Puri. This was something very different plus I had not yet featured any puri recipe for the blog. However typically puri is always accompanied with a side dish like a potato curry or chole made with chickpeas. So while I was thinking which of these two to make with puri, ,my MIL threw in the idea to combine this with Besan Chutney. I was super excited with both the recipes. They dishes were new, fresh and sounded delicious. Now I had to just start making it. it till there are no lumps. 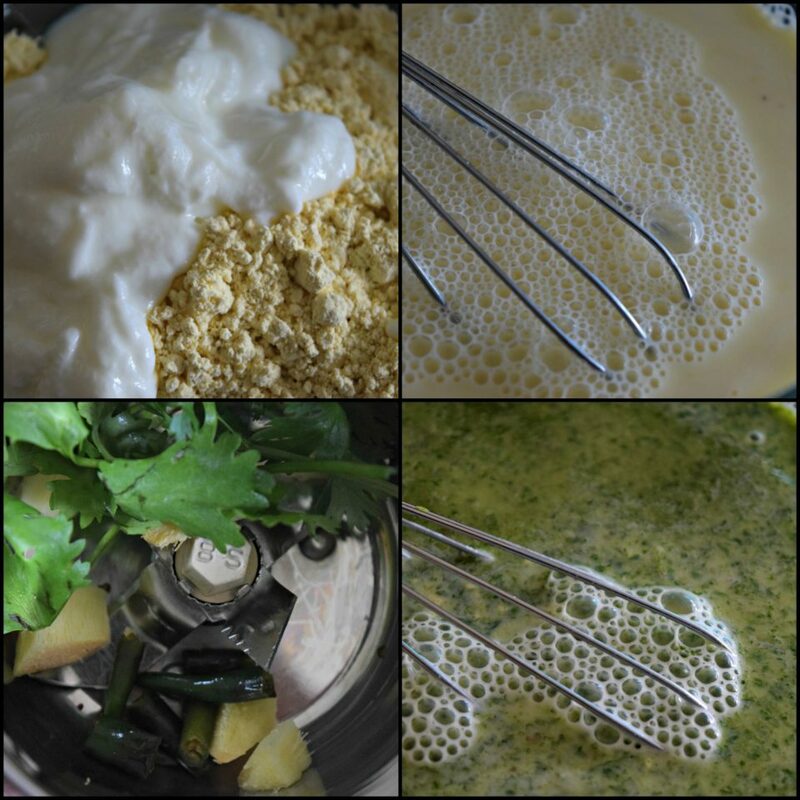 Make a smooth paste of cilantro, ginger and green chillies. Add this paste to the thin batter. Mix it. 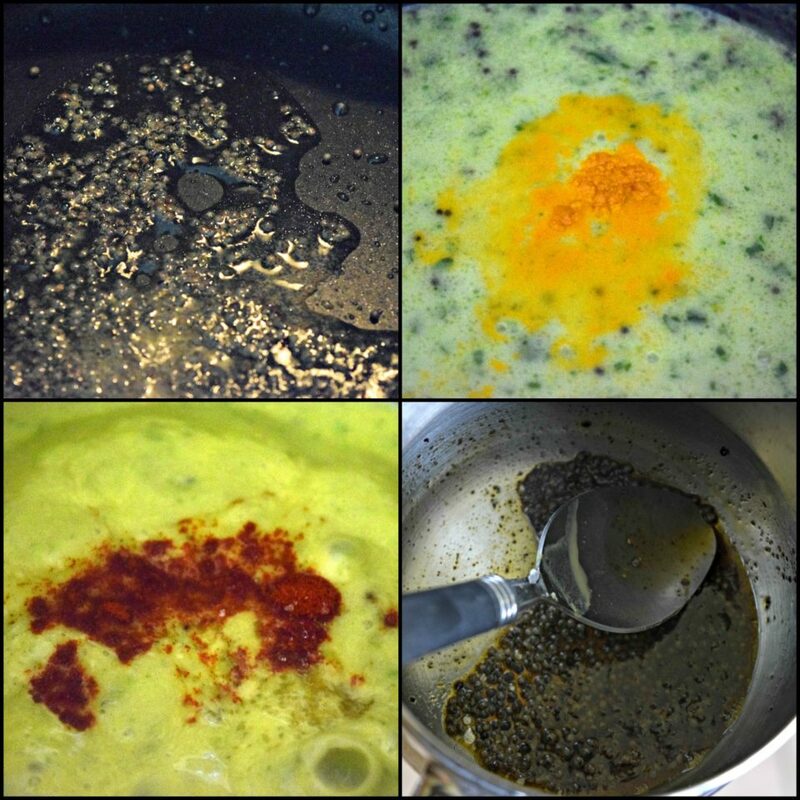 , temper mustard seeds and once you take it off the flame, add chilly powder. 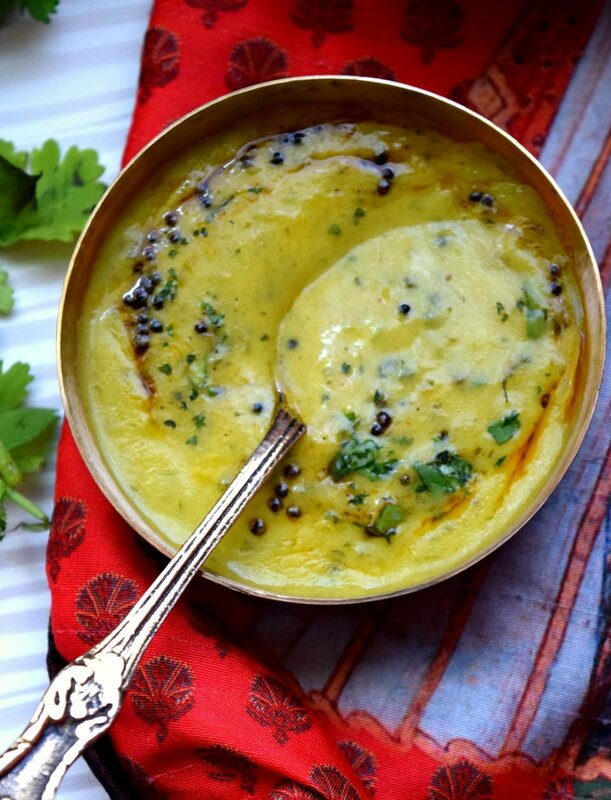 Pour this tadka over the chutney. Garnish with cilantro and serve it with puri/roti/dosa/idli. This besan chutney is unique in its taste. I found it similar to the Maharashtrian Pitla which is also made using chickpea flour. However due to the yogurt used here, the chutney has a refreshing flavor. The sweet potato masala puri and besan chutney made a great combo and all I can say is that I have fallen for this creamy chutney which is truly one of its kind. 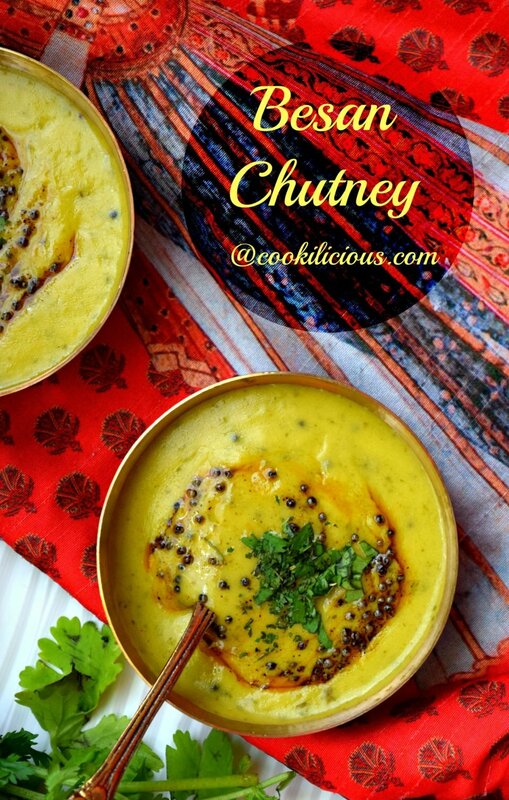 An unique Indian chutney recipe made with chickpea flour and yogurt. Pairs best with puri/roti/bread/dosa/idli. 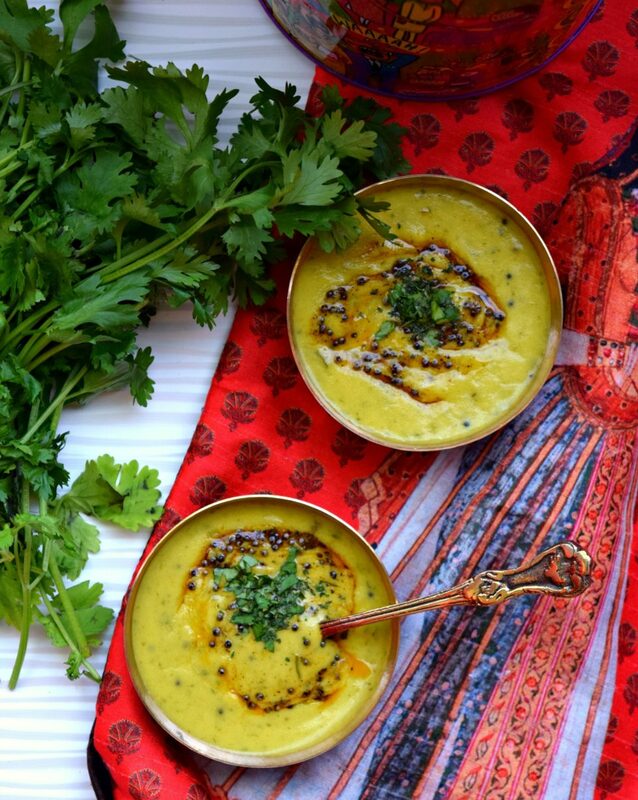 A simple yet delicious recipe from Bombay! In a mixing bowl, add yogurt and besan (chickpea flour). Add water and whisk it till there are no lumps. Make a smooth paste of cilantro, ginger and green chillies. Add this paste to the thin batter. Mix it. Heat oil in the pan. Temper mustard seeds. Pour the batter, add turmeric powder, chilly powder, asafoetida, sugar and salt. Keep stirring and bring it to a boil. Then continue to cook it for 5-6 minutes. The mixture will thicken. Take it off the flame. 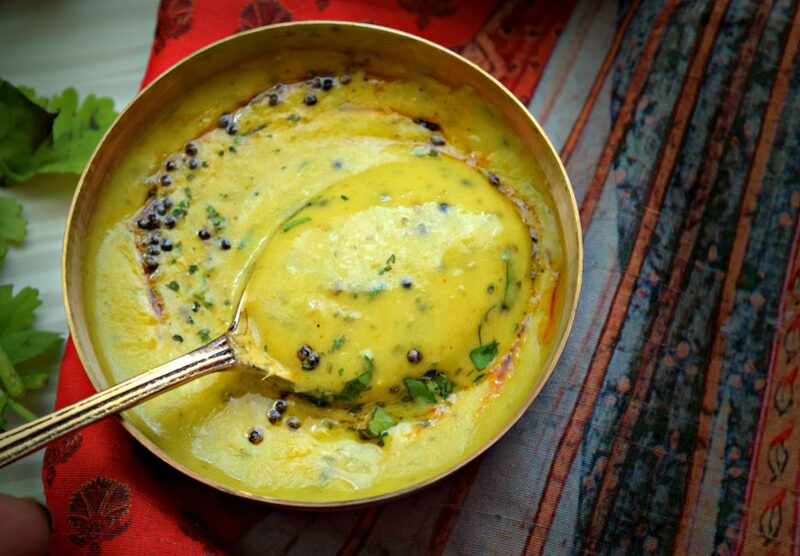 In a tadka pan, temper mustard seeds and once you take it off the flame, add chilly powder. However I have still not been able to figure out why and how it has got its name ‘Bombay Chutney.’ I need to check where this chutney is served in Bombay when I visit next time. But whatever be the case, I am just glad that I finally got introduced to this lip smacking cool and spicy chutney here in the US, while it was literally from my backyard. Thanks to my MIL for giving me this simple yet effective recipe. Cannot wait to try this recipe with dosa and idli now. wow! never heard of besan chutney before. Saving your recipe for later. Oh! Wow! This chutney looks really enticing. I love its color and consistency. It looks really healthy. This chutney looks stunning. I have some besan flour in the cupboard so will definitely be trying this one! Do you recommend anything to use in place of the asafoetida if I can’t source it here in NZ? Thank you for this lovely recipe. Thank you so muc. Yes do give it a try and let me know how it was. You can skip adding asafoetida if not available.